When you are choosing materials for the outdoor areas of your property, you need to focus on buying products that will be long lasting and add to the value of your home. This is where pavers come into the picture. You can choose from ones made of natural stone, brick or concrete. You also have the option to construct retaining walls at points where you feel the landscape needs some support. The landscaped areas of your property add to the beauty and functionality of your home and there are softscaping and hardscaping features that are used to create the right balance in the landscape. The only way you can be assured that your plantings continue to be healthy and appealing, are to ensure that they are all cared for with regularity. Even the masonry features in your landscape need a certain amount of attention and maintenance. Most landscape projects include a certain amount of excavation work. Sometimes the land may be sloping or the grading may not be right. In some instances, homeowners want to build some outdoor features etc. In all these situations, it becomes necessary to excavate a certain portion of the landscaping; a skilled landscaping company will provide excavation services. Every landscape has a number of features that go into making a cohesive, attractive and functional whole that will add to the functionality and value of your property. 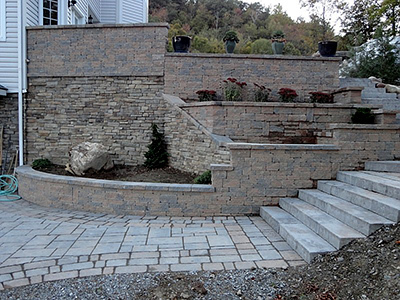 Landscape masonry is a very important aspect of every garden and yard design project and this includes various features made of brick, concrete and natural stone etc. The masonry becomes the base of the rest of the features and it’s crucial that strong and resilient materials be used in the work; this adds to the longevity of the landscaping. When you want landscape features that will add to the beauty and value of your property, you should hire a reputed company like From The Ground Up, for the job. This will ensure you have a resilient and beautiful landscape that looks good and lasts for a number of years.